This is the only time the course will be offered at this price! The value of this course is over $1400! The introductory price of $300 will only be offered for the Beta Launch. The next time this course is offered *sometime* in 2019 it will be double the price for VIP Access! You will receive an email with 24 hours of enrolling in the Website Whiz course with a confirmation and next steps. Course modules cover everything you need to set up your site including installing WordPress, themes and plugins, planning content, designing and launching your site and connecting to Google Analytics. Screencast videos walk you through all the tech stuff step-by-step and show you how to complete the workbooks and content templates. Interactive Action Steps make sure you’ve completed everything you’ve learned and are prepared for the next lesson. Workbooks give you an overview of each module and help you complete each step. Content templates make writing content for your site easy and manageable. Find useful resources for images, branding and fonts, hosting, themes and more. Access the training library at any time to learn everything you need to know about how to use WordPress. Find support and inspiration in our exclusive online community just for Website Whizzes! I will teach you step-by-step everything you need to know to plan, design, build and launch your own website! For course modules and topics click the Learn More button below. Create a website you are proud to show off! Learn how to plan, design, build and manage your own website. Still not sure if the program is right for you? I'd be happy to answer your questions and have a quick chat about the course before you enroll! Do I need to be a tech geek? No, but you should be somewhat comfortable with using the computer, internet and online software programs in general. But don't worry, we will go through the tech stuff step-by-step on video so you can see exactly what we are doing and follow along at your own pace. While there are plenty of free WordPress themes available, they may not have the best support or range of features and layouts. I suggest the Divi Theme from Elegant Themes, and will be using Divi in this course to show you how to design and build your site. You will receive a copy of Divi or your choice of themes from Elegant Themes with your course access, to get you started. You will need to purchase a licence to receive updates and theme support from Elegant Themes. I am not a "creative" type. Will this course be good for me? Absolutely! This course will give you the basics of good design that you'll be able to use on your website and other aspects of your marketing and branding. Is copywriting included in this course? We will get into creating a content plan and developing keywords and appropriate content for our audience, but we won't get into specifics of what to write (each business is so different, it would be impossible to cover everything in one course). In addition to helpful content guidelines, you will have access to some of my favourite copywriting resources. Do I have to have a WordPress website installed? Not yet! If you don't have WordPress, hosting and a domain set up yet, we will cover that in Module 1 with video instructions to walk you through setting up a self-hosted WordPress website. WordPress itself is free, but you will need to purchase a domain name, hosting and a theme. WordPress is one of the most recognized and reliable website platforms in the world and has a huge network of developers that are constantly improving it. For the DIYer, there are a ton of amazing plugins and themes to do just about anything you need without knowing how to code. Out of the major website builders and platforms, WordPress has the best reputation for good SEO practices. I've never used WordPress before - will you teach me how? Yes, there is a full module dedicated to WordPress basics such as creating pages and posts, installing themes and plugins, and how to make changes to the default configurations. I'll even show you what plugins I use to make my clients' websites more effective and efficient. 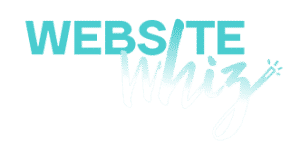 Your Website Whiz enrolment also includes access to my full WordPress Video Training Library so you can learn all the basics plus more complicated stuff like how to set up Google Analytics! Can I really set up my whole site in a week? Yes!! The time it takes for each person to go through the course will vary depending on how much time they can dedicate, how tech-savvy they are and how much they have prepared in advance. However, it is completely possible to go through this course and have a finished PRO website to show off in a week! Some of the links in this post may be "affiliate links." This means that if you click on the link and purchase the item to which I am linking, I may receive an affiliate commission. I want to emphasize that I do not, and never will, link to a product only for possible financial gain. Doing so does not provide real value, and is a disservice to my clients and subscribers. I do not link to products I feel are inferior, and I am not compensated for any positive review.